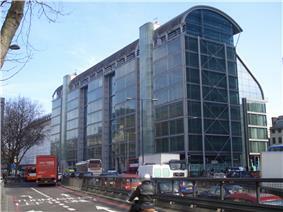 Having been open since 2007, Wellcome Collection plans to open additional public spaces in the building in autumn 2014. The first printout of the human genome to be presented as a series of books. Medicine Man A permanent display of a small part of Henry Wellcome's collection. Medicine Now A permanent exhibition using art, mixed media displays and objects to present some aspects of modern medicine and of the work of the Wellcome Trust. This area features a postcard wall where visitors are encouraged to contribute drawings. Exhibition space A changing programme of events and exhibitions. 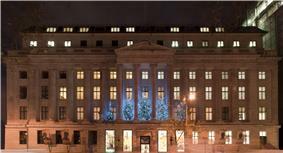 The building foyer and public areas usually include a 1950 work by Pablo Picasso (originally on a wall in John Desmond Bernal's flat in Torrington Square) and one by Anthony Gormley. However these are not on view during building works (2013–2014). A figure by Marc Quinn  was originally lying unprotected on the stone floor, then moved inside a glass case, and is also not currently on view. 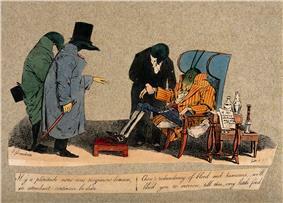 Three leeches attend a grasshopper, prescribing a course of bloodletting, cartoon by Jean-Ignace-Isidore Gérard c.1832. 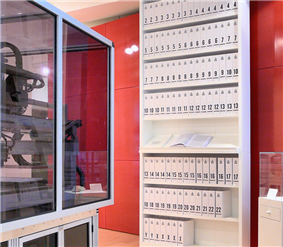 Wellcome Library collections.